Tell a story about you: Be specific. 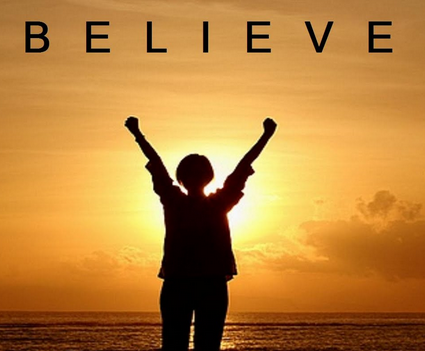 Take your belief out of the ether and ground it in the events of your life. Consider moments when belief was formed or tested or changed. Think of your own experience, work, and family, and tell of the things you know that no one else does. Your story need not be heart-warming or gut-wrenching—it can even be funny—but it should be real. 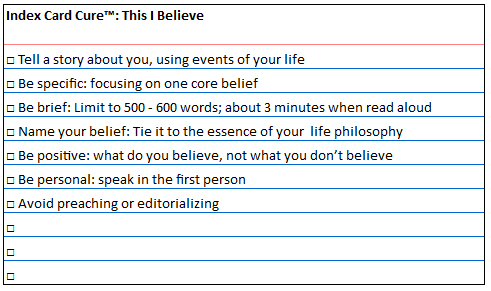 Make sure your story ties to the essence of your daily life philosophy and the shaping of your beliefs. Be brief: Your statement should be between 500 and 600 words. That’s about three minutes when read aloud at your natural pace. Be personal: Write in words and phrases that are comfortable for you to speak. We recommend you read your essay aloud to yourself several times, and each time edit it and simplify it until you find the words, tone, and story that truly echo your belief and the way you speak. In introducing the original series, host Edward R. Murrow said, “Never has the need for personal philosophies of this kind been so urgent.” Here’s the website for more information and/or to submit your own statement of personal belief http://thisibelieve.org/. Please contribute.